In an increasingly competitive digital world, it’s easy for your message to get lost in the inbox. Over 280 billion emails are sent every day, waiting for opens and clicks, but often going unread. 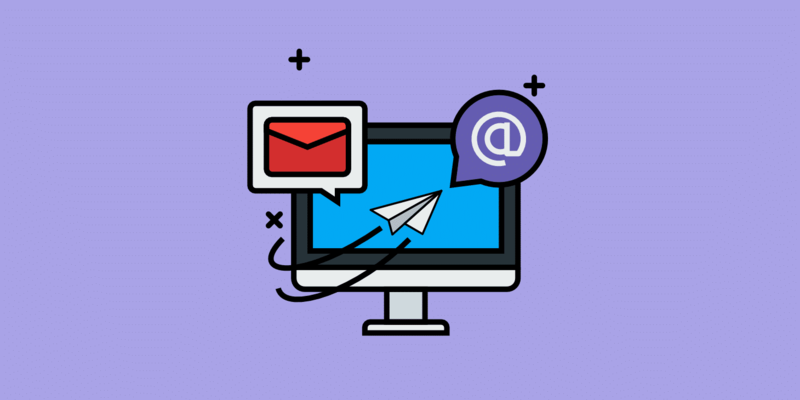 With so much competition for getting your email in front of your subscribers, it can seem exhausting to invest time on email marketing strategy. But before you write it off, know that email marketing has one of the highest ROIs of digital marketing tactics. 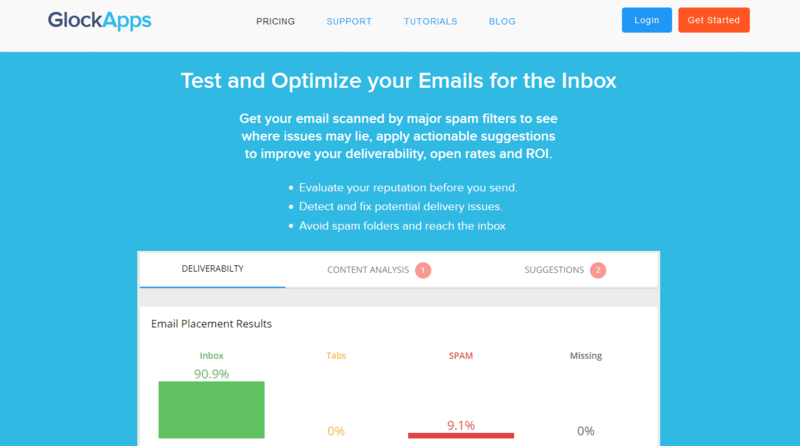 For every dollar you spend on email marketing, you stand to make $38 in return. It’s worth another look, right? 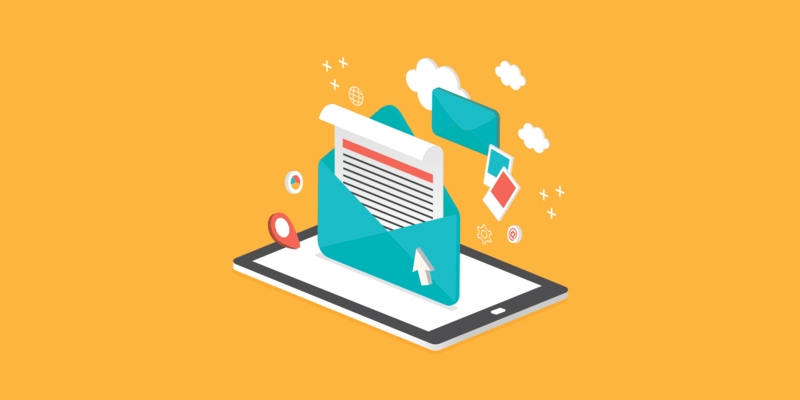 Luckily, there are plenty of tips to help give your email marketing strategy a competitive edge. 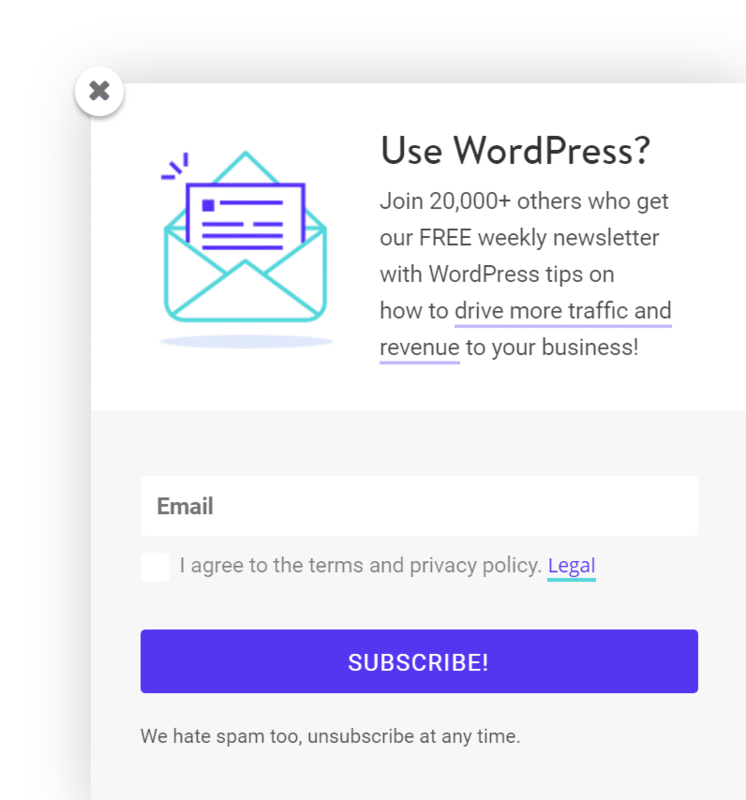 In this post, we’ll talk about 11 tips you can start doing right now to boost your email conversion and subscriber rates. First thing is first — you’ll need a list. No matter how solid your email marketing strategy is, if you don’t have a subscriber list, you’ll never reap the rewards. Email marketing, according to the Data and Marketing Association, packs a big ROI punch — to the tune of a 4300% return on your marketing investment. To scale that ROI in a way that impacts your bottom line, you need to build, nurture and grow your email subscriber list. So how do you start raking in those sign ups? Here are three easy places to start. If you don’t yet have a blog yet, don’t think about it, just do it. Marketers that use blogs for lead generation and sign-ups see 97% more inbound leads on average than those that don’t blog. We can also personally vouch for this at Kinsta. Check out the SEO checklist that we used to increase our traffic by 571%. Add opt-in forms to everything. People won’t spend time searching for a “subscribe” button. Bring it to them. 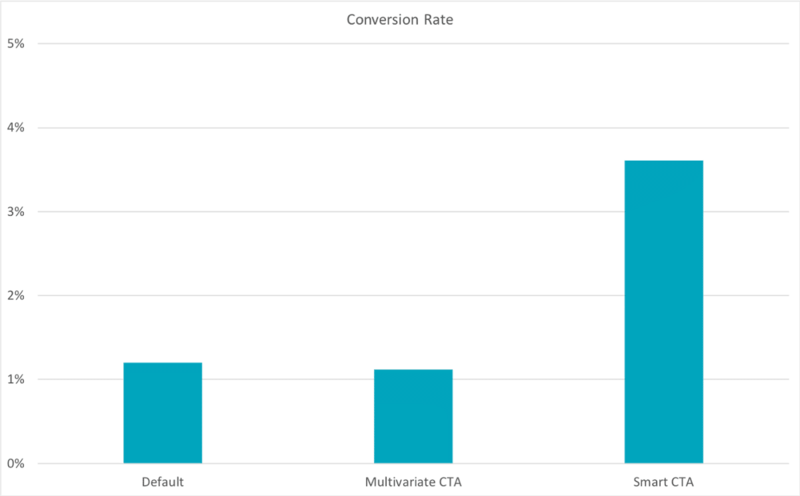 Unbounce discovered that on-click pop-ups performed 1,147% better than their exit popups. If you don’t want to do pop-ups, you could do what we do at Kinsta and add a slide-in (as seen below) at the bottom of each post after a reader scrolls 75%. This is a little less obtrusive but still very effective! Check out some different lead generation plugins you can use. Use social media to your advantage. Optimize your bio by including a link to your newsletter, consider running an ad to link content and give content away on your social platforms. Nathalie Lussier grew her email list by 3,000 subscribers with her first Twitter chat and email marketing challenge. Once you’ve built up a hefty contact list, what should you do with it? 75% of email revenue is generated through automated email campaigns. It makes sense, right? As your list grows, you can’t be a frantic hamster on an endless wheel of manual emails. You need to automate if you want to scale. 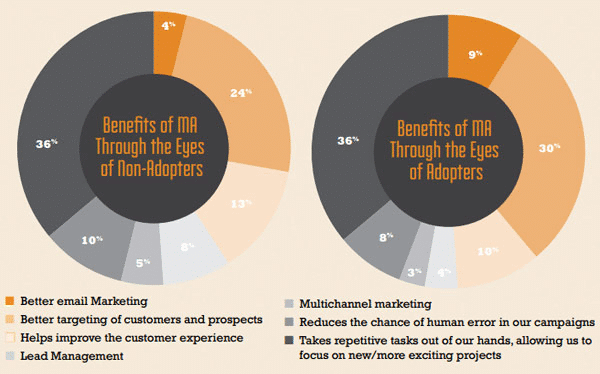 72% of marketers say that automation is beneficial to their organizational strategy and 78% of marketers say that the benefits of marketing automation contribute directly to revenue. So how do you put automation to work? First, when you gain a new customer or subscriber, make sure a process is in place to send them a welcome email within the first 24 hours. It’s worth your time. Welcome emails generate 320% more revenue on average than other promotional emails. Domino improved open rates by 11% and increased their click-through rate by 23% just by optimizing their welcome emails. Secondly, consider breaking longer emails up into drip campaigns. 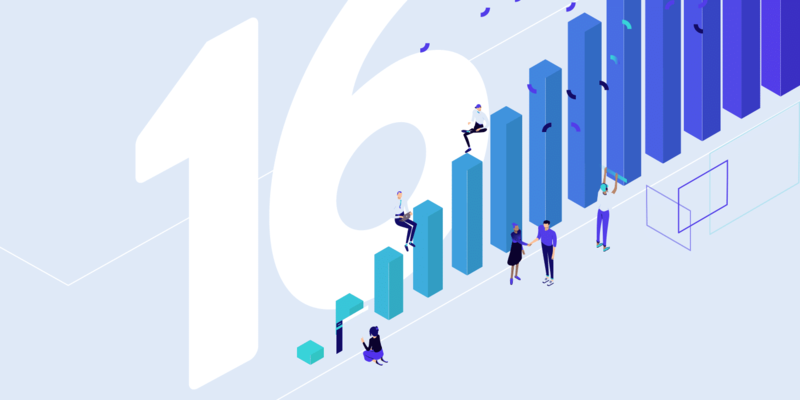 Open rates for drip campaigns are 80% higher than non-automated, one-time send emails, and the average click-through rates for drip campaign emails are three times higher. Sony saw a 157% increase in click-throughs with their drip campaign to Sony Rewards loyalty club members. And, Sony isn’t alone. There are many businesses who have used automation to skyrocket growth. Monin, gourmet flavored syrups brand, used email automation to segment their customers between B2C and B2B. It worked. Monin’s Mother’s Day’s automated email campaign drove nearly 40% of email revenue in one month. That’s a 20% increase from the previous year. 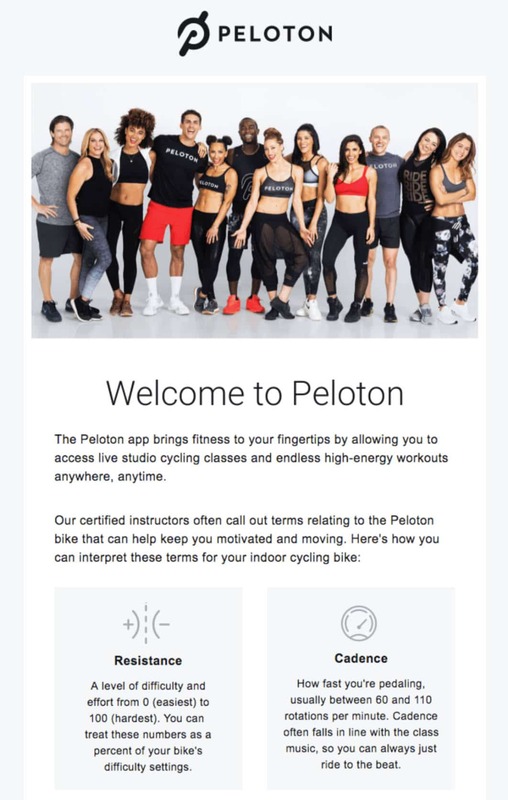 Peloton sends out welcome emails immediately after a customer purchases one of their stationary bikes or downloads the app. Brad Olson, Peloton’s SVP of Member Experience, talks to true ventures about how they cultivate emotional loyalty with their onboarding emails. Not sure which email marketing platform to choose? Check out this list of some recommendations. We are big fans of MailChimp at Kinsta. Now that you know when and how to automate your campaigns, it’s time to think about content. Almost half of the consumer population says they receive too many emails. Think about your own inbox. It’s a constant struggle to sift through dozens of emails every day to get the information you want, right? While blog posts and online articles can get away with higher word counts. Your email readers don’t want to read a mini-novel. They want you to get right to the point. 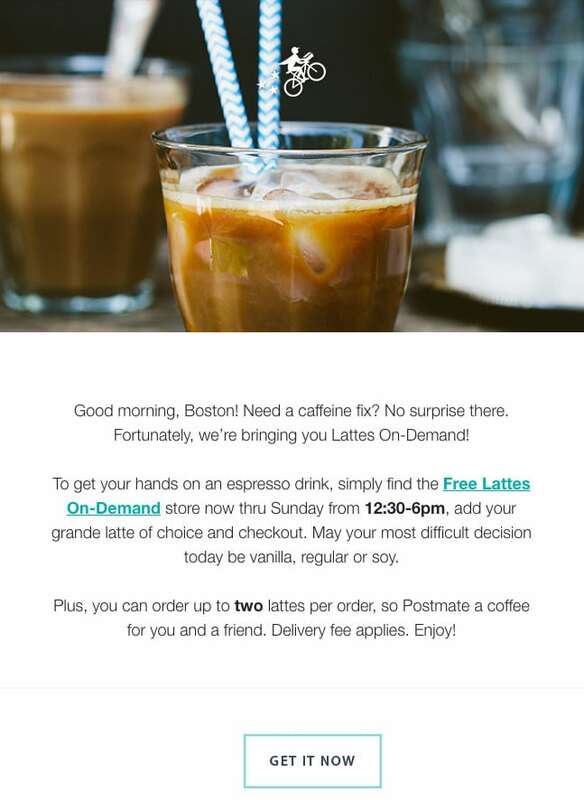 Take this example from Postmates. After a brief introduction, they get right to the benefit to the reader, followed by a clear call to action. It wasn’t just about seeing which email had the highest open rate, but also about determining which copy enabled a customer to take a specific action. If you don’t think brevity matters, then remember that the attention span of the average adult is less than eight seconds. So what’s the sweet spot for email length? While it isn’t a one-size-fits-all metric, a recent study by Boomerang found that marketing emails with 125 words or less saw a response rate of around 50% (for reference, that’s well above average). Look at this example from Evernote. It’s short, sweet and has a clear call to action. Readers can digest the message and the CTA in seconds. 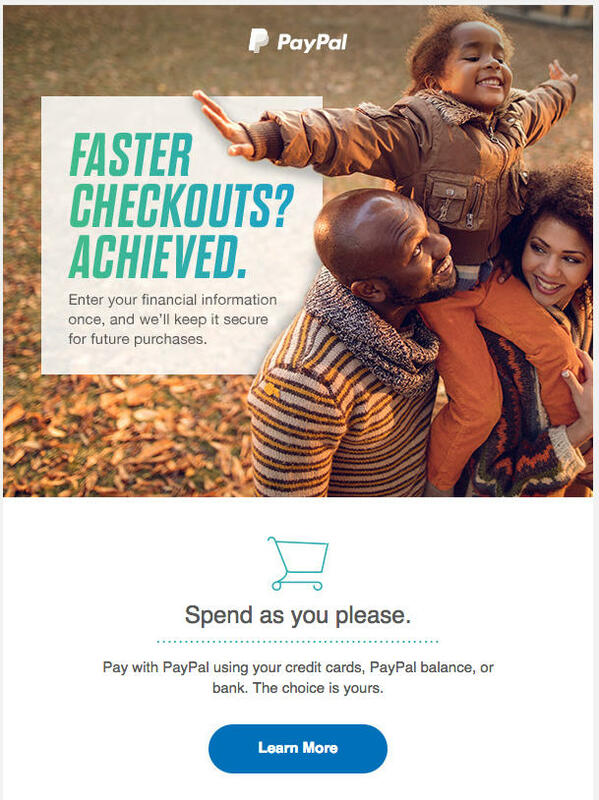 Paypal also does an excellent job of using imagery instead of copy to evoke action. For example, this email contains less than 40 words but conveys the simplicity of using Paypal for an easy checkout experience. Once you’ve trimmed your content down to size, it’s time to get your readers’ attention. If you get the subject line wrong, content doesn’t matter. You’ll never get past the preview in your audience’s inbox. 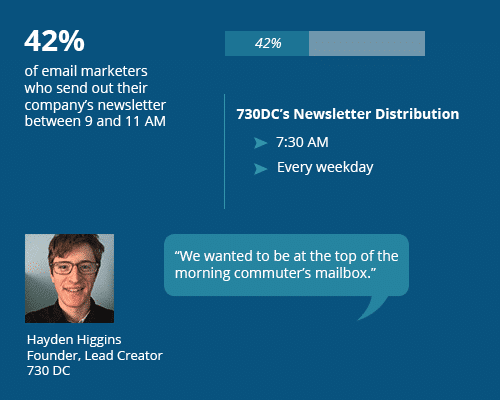 47% of readers decide whether or not to open an email based solely on the subject line. So how do you entice your readers to open your message? One way is to practice the “benefit, logic or threat” method, which is simply offering an obvious benefit, a “common sense” statement or “don’t miss out” type content. 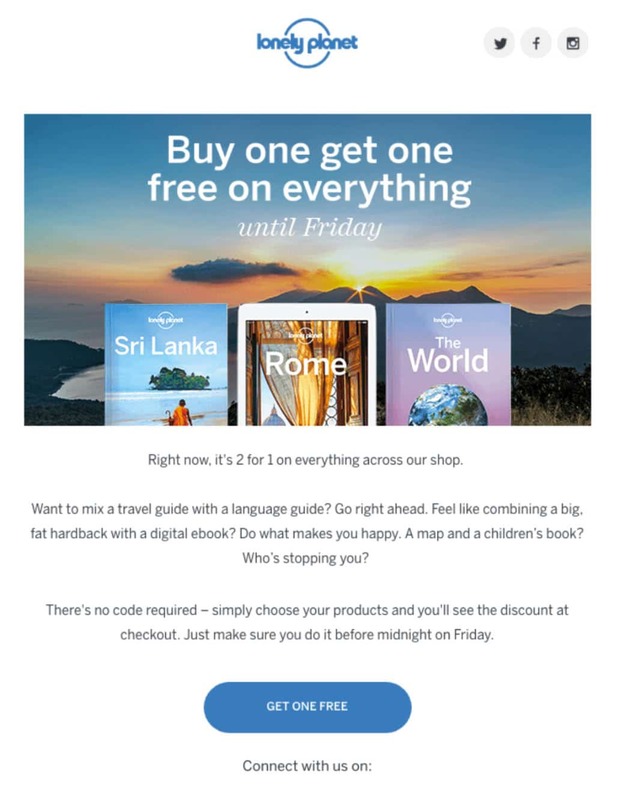 For example, Lonely Planet offers a distinct “benefit” with the headline “Buy one get one free on everything until Friday” in this email. Readers benefit by clicking on the email to get information about the sale. As an example of “logic,” look at this email from Barkbox. Their members clearly love their pets and are logically very likely to celebrate their birthdays. 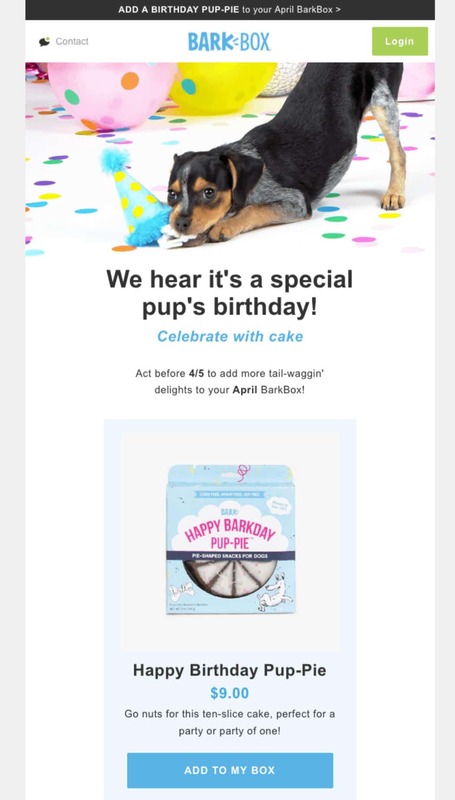 The subject line “Add a birthday pup pie to your April Barkbox” is a logical appeal to the core Barkbox audience. 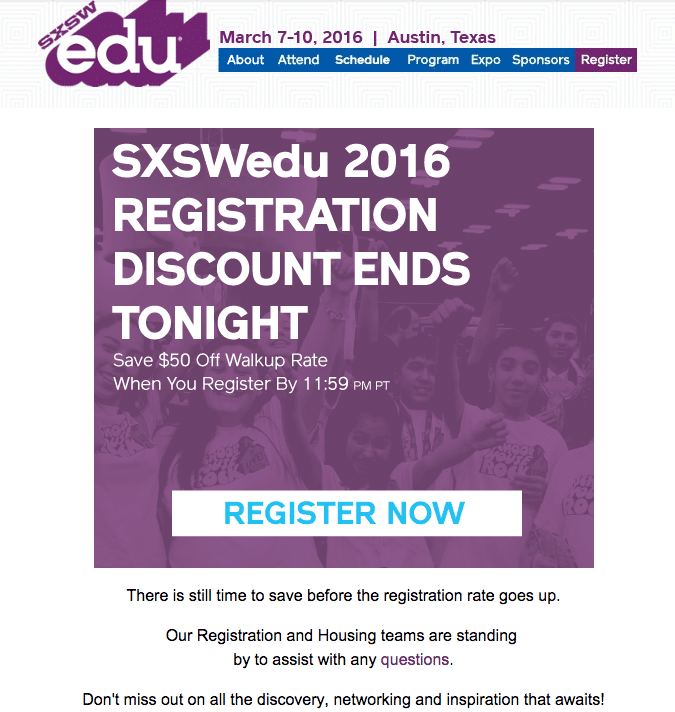 What’s an example of a “threat?” Take a look at this email from SXSW. The threat, in this case, is the fear of missing the registration deadline. The goal with this type of subject line is to create urgency with your reader. Once you’ve identified your “hook,” make sure it’s a short one. Research from Invesp shows that readers prefer short, personalized subject lines. 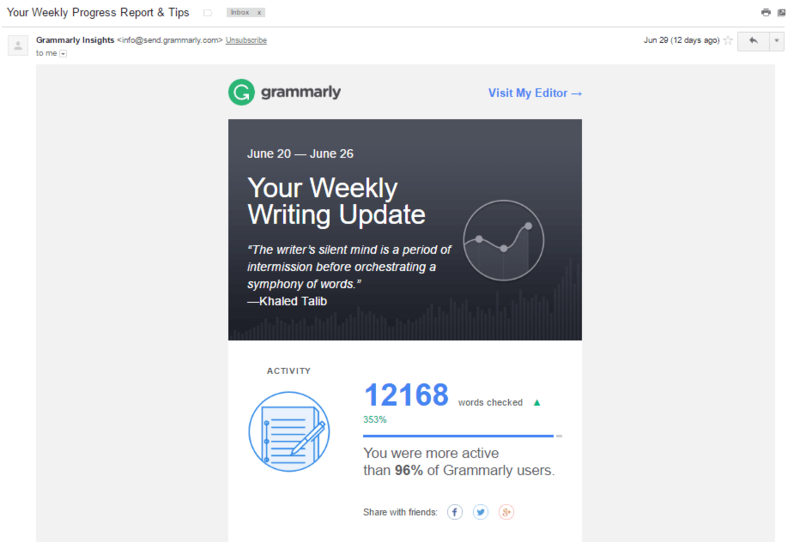 Grammarly does this well with their “personalized benefit” approach. It’s short and to the point, with a clear benefit of offering helpful tips. And don’t to forget proofread all your emails before you send them. Now that your subject line is a work of art and your reader can’t wait to open your email — what’s next? We’ve already discussed the importance of brevity. It shouldn’t come at the expense of audience engagement, though. 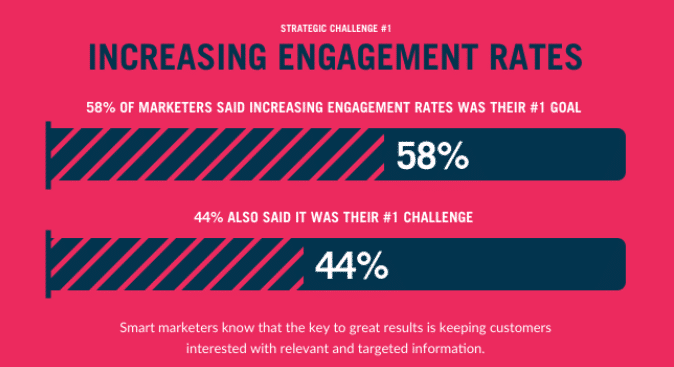 While marketers say that a higher engagement rate is their top email marketing priority, they also admit that engagement is no easy task. How do you make sure your readers are paying attention? Give them a reason to interact with you after they finish reading your email. For example, you might try asking them questions. The human brain is wired with a desire to answer a question once it’s asked. Even if you aren’t asking for a direct answer, a well-placed question plants your brand in the mind of your reader. Secondly, link to relevant content. It keeps your readers engaged with your brand. Pardot offers a simple tool to help measure the engagement level of your email content to see if you’re hitting the mark or leaving readers bored and confused. Organizations are getting creative with engagement strategies. 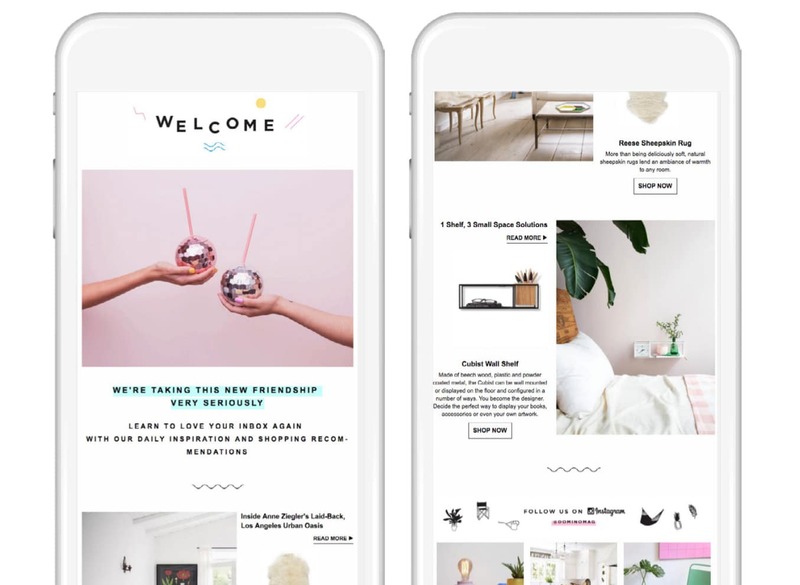 The marketing team at Hammock ran an experiment to increase engagement levels with their newsletter emails. Instead of heavy content, they trimmed, reframed the email to be an “idea email” instead of a newsletter, and “teased” deeper content instead of dumping it all out at once. It worked. They saw a 48% increase in open rates with their new format. Now that you’re engaging with your audience and they are responding to you, it’s time to broaden your reach. Make it easy for your audience to share your message, or else — they won’t. Emails with social sharing buttons have a 158% higher click-through rate than those without them. As you think about design, make it perfectly clear what your social sharing buttons are actually sharing. We’ve all clicked on a “share” icon only to find it links to something other than the piece of content we were just reading. Look at this example from Salesforce. The social sharing buttons clearly state what is being shared and on which platforms. 80% of marketers say that their social media sharing efforts have increased web traffic. It’s an easy addition to your emails that adds value to your readers and your bottom line. 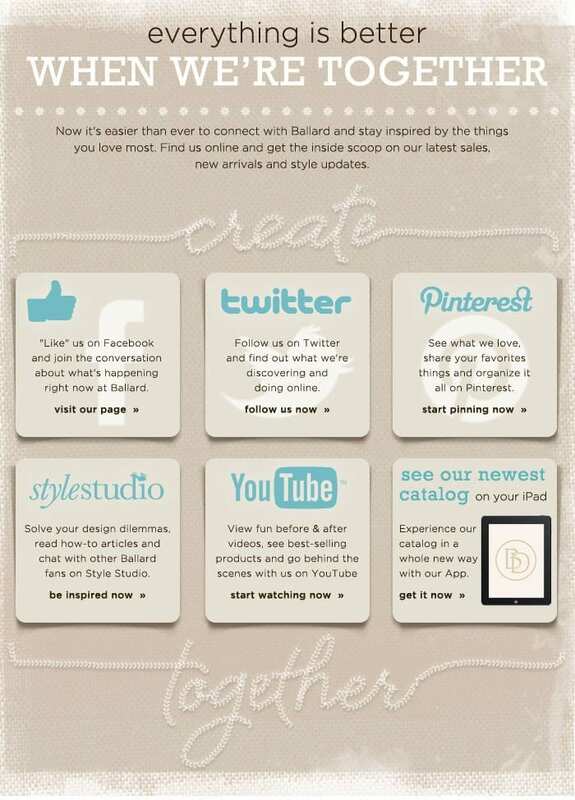 Look at this email from Ballard’s (a European design store). Each box has a clean, simple design with benefits clearly listed for each social sharing platform. You might also consider adding plugins to your blog to further enable you easy content sharing between your site and your social platforms. Speaking of clarity, have you asked your readers what actions you want them to take after they read your email? If you don’t tell your readers what you want, they’ll never know. Every email needs a strong, clear call to action (CTA). Research shows that a CTA can increase your click-through rates by over 370%. 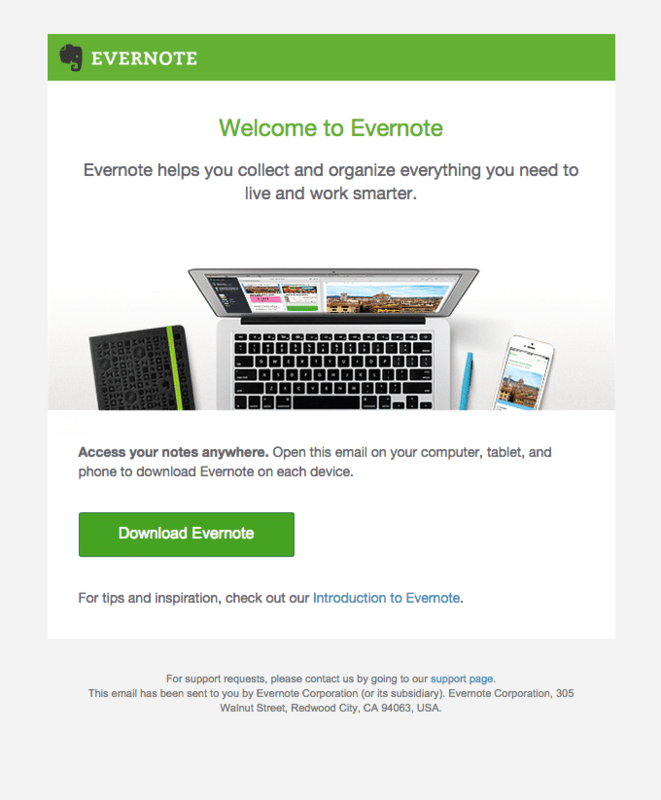 Email marketing lends itself well to personalized CTAs (or what some call “smart CTAs”). In fact, HubSpot found that targeting a CTA to the user’s interest drove 202% more leads than generic CTAs. CTAs come in many different forms and flavors. 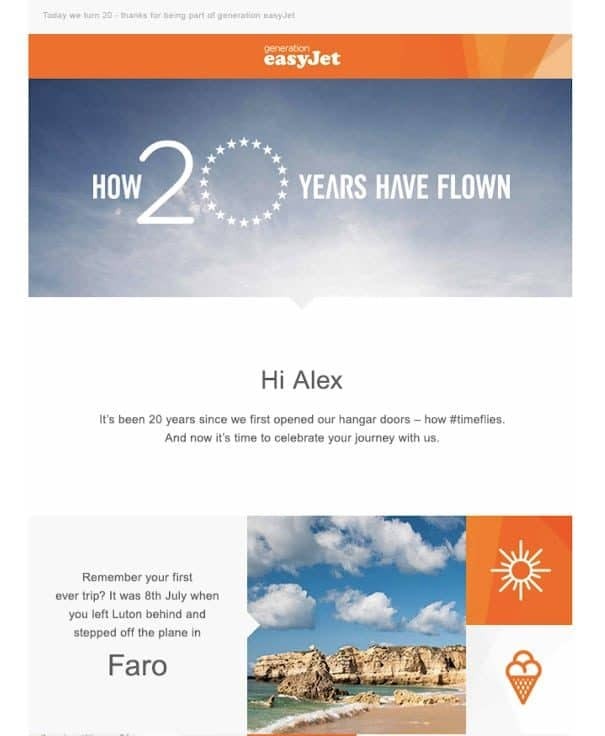 To commemorate its 20th anniversary, easyJet, the airline, sent out an email campaign made up of warm accents complement the brand’s signature orange color. The CTA’s tell a story to guides the readers to continue their adventures. Experiment with button styles and colors to see what your audience prefers, by running some simple A/B tests. After you gain traction with audience engagement and start to see more conversions from your CTAs, it’s time to think about how often to reach out to your subscriber list. One of the most challenging pieces of the email marketing puzzle is knowing how often to contact your subscribers. Reach out too much, and they unsubscribe; too little, and they lose interest in your brand. It might also vary depending on how much new content your actually able to share as well. Most consumers prefer to receive one promotional email at least once a month, and 15% of consumers said they wouldn’t be annoyed by receiving one every day. The sweet spot is likely somewhere in the middle, but it’s up to you to find it. It varies by industry, audience, and content. We send out our newsletter at Kinsta once per week. You’ll need to monitor unsubscribe rates after each campaign and adjust your send frequency accordingly. One way to know how often your audience wants to hear from you is to simply ask them. Take 730DC, for example. The Washington DC-based volunteer organization knows that their audience wants frequent updates about events and volunteer opportunities. As a result, they send a daily newsletter. They also researched the best time of day to ensure their messages are seen by their target audience. Quality over quantity — Emails may be cost-efficient, but it’s no excuse to not produce quality content to give to a targeted audience. 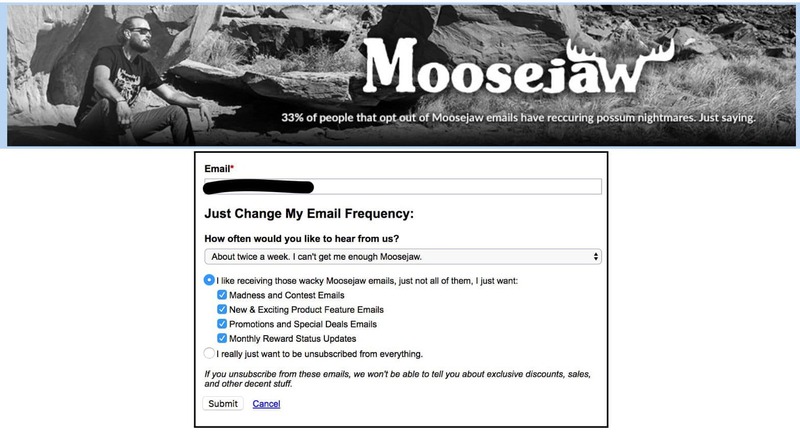 You should also give your subscribers a choice about how often they hear from you by enabling contact preferences, which are simply a way for your subscribers to tell you how often to email them. It increases the likelihood that they stay engaged with your content, and will make them less apt to hit “unsubscribe” if they have control over the number of emails they receive. For every 12.5 million emails that are flagged as spam, only one person replies. Talk about a lousy ROI. It’s not worth your time or the risk. If you want to be certain that you comply, use a tool like GlockApps to run your content through a spam checker. There is nothing worse than carefully crafting an email, only to find out that it went straight to your audience’s spam folder. You should also authenticate your emails by adding DKIM and SPF records. Check out our in-depth tutorial on how to authenticate your emails. Design like you are absolutely right, then optimize like you were wrong from the start. Put simply: as you think about email design, make sure you optimize it for your mobile users. Consumers prefer to purchase from a mobile website or app. And, as a retailer, you are expected to deliver a mobile-friendly experience that pushes the consumer down the purchase funnel. Retailers who fail to optimize both the email and the landing page for mobile may drive potential buyers away — permanently. Up to 75% of emails are opened on mobile devices, and 57% of users say that they won’t recommend a brand with a poorly-optimized mobile experience — let alone buy from them. Still need proof? 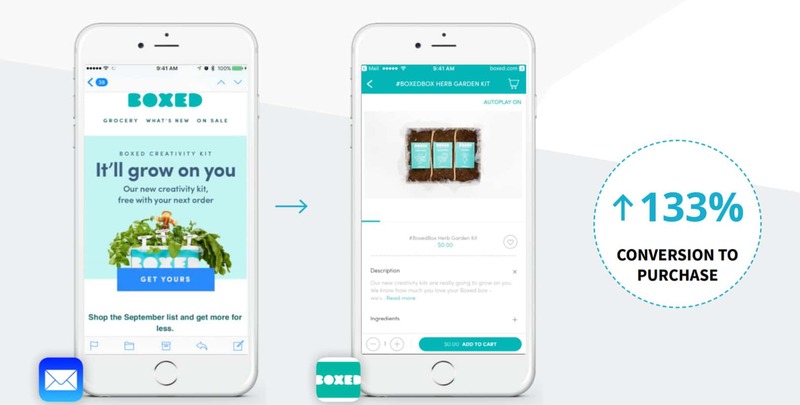 Boxed sends its users weekly deal emails. They saw 133% higher conversion to purchase by integrating deep links to their mobile app. So how do you ensure a great mobile email experience? A few things to consider: reduce image sizes to prevent slow load times. Some email channels (like Outlook) block images from being rendered. Use a tool like TinyPNG to compress images down to so you don’t get stuck in the spam folder. Secondly, increase the size of links and buttons in your email so readers can easily select the ones they want on the first try. Fun fact: according to an MIT study, an adult index finger is 1.6-2 cm on average, which equates to about 45-57 pixels on a mobile device. Don’t give mobile users the dreaded “sausage fingers” complex. Make it easy for them to click on what they want. Lastly, don’t forget to include a plain text version. Even if you’ve labored over your beautiful HTML design, some readers simply prefer to read in plain text. If you still aren’t sure if your content will translate seamlessly to mobile, use a tool like Email on Acid. After you’ve designed, mobile optimized and launched your first campaign, don’t neglect to see how hard it’s working for you. We’ve all heard the adage “that which isn’t measured isn’t improved.” Email marketing is no exception. Without defined metrics and persistent tracking, your results will eventually stagnate, and you’ll be left wondering what went wrong. If your email platform has built-in A/B testing, which most do now, it’s a great place to start to see what resonates best with your audience. During his 2012 campaign, Barack Obama raised over $690 million in donations, in part, thanks to a dogged commitment to email A/B testing. 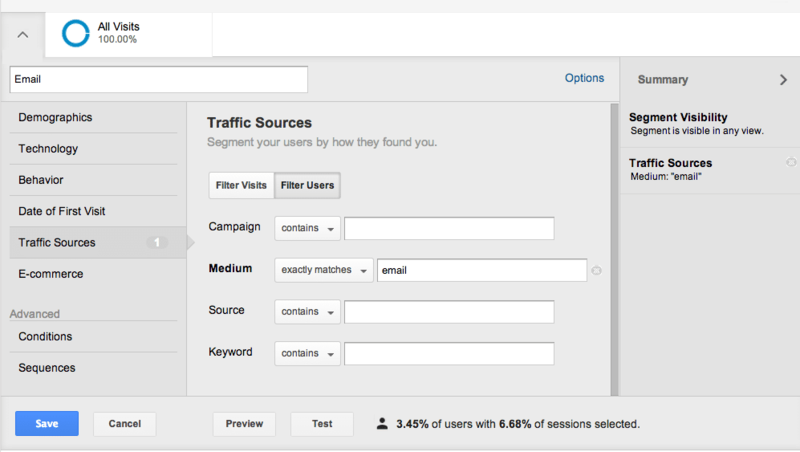 You can track email metrics in Google Analytics using UTM tags. To view your campaign, head over to Acquisition > Campaigns. Many email marketing tools also have the ability to auto-add UTM tags for you. Whatever metrics you choose to measure, don’t just do it once. After you make tweaks to your strategy, stop and measure again. Email marketing strategy should always be evolving. There are almost three billion email users worldwide, sifting through almost 300 billion emails a day. With a median ROI of 122%, email marketing remains one of the smartest, most cost-effective tools available to marketing teams. But if the average consumer receives over 70 emails per day, marketers have to be creative to cut through the inbox noise. Email marketing is not a lost cause. It’s an opportunity for the kind of creative, grassroots marketing that attracts many people to the marketing field in the first place. Email is a push channel, so we need to push it to work harder. Carefully consider your email design, include clear calls to action and persistently test and improve your campaigns. 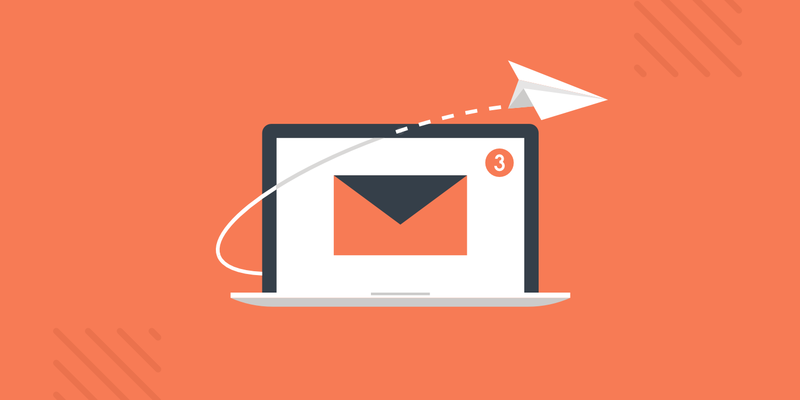 Email marketing will almost certainly boost your subscriber rates and conversions if you follow these and other tried and true best practices. “Email marketing is a powerful way to turn leads into customers and customers into loyal brand evangelists”. This seems to me the right definition of Email Marketing. Thanks a lot for sharing the ways and tips for a successful Email Marketing. I got some so important tips from your post. I do hope it will help me a lot. For good ROI, Email marketing is so powerful digital marketing strategy. For this reason, I love email marketing very much. I think Investing in email marketing is sure worth it — as long as you do it right. What’s yours?